Not everyone who owns a Mac is a design student or film producer. Microsoft today threw its Apple business users a bone with the announcement of Exchange support for Entourage and a new Outlook for Mac application coming soon. 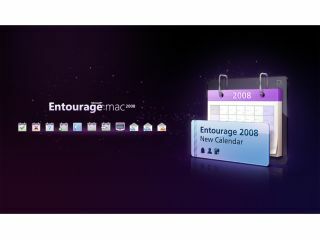 For current Entourage users, Microsoft Entourage 2008 for Mac, Web Services Edition is available today as a free download from http://www.microsoft.com/mac/downloads.mspx?link_name=downloads. The update promises performance and reliability improvements, and enables users to sync Tasks, Notes and Categories. It gives Macs support for the latest version of Microsoft's corporate Exchange Server, and improves compatibility with Windows-based Office software. The Entourage update is part of the Office 2008 Business Edition package, available in mid-September for £440 (or £270 for an upgrade). The application also includes: Microsoft Document Connection for Mac to improve access and browsing to documents on SharePoint and Microsoft Office Live Workspace, 200 business templates and clip art and some online training. The other announcement - the arrival of Outlook for the Mac - will happen with the next version of Office. This will feature a new database that enables backing up files with Time Machine and Spotlight searching and information rights management to control the distribution of files and messages. Eric Wilfrid, general manager for the MacBU at Microsoft, said: "Outlook for Mac will bring features our customers have long requested that make working across platforms even easier. I think people will see that this move to Outlook for Mac is more than just a name change."